This book is a heavy-duty analysis of the national debt and its long-term implications, written by heavy-duty analyst Senator Tom Coburn. The author serves on the Senate banking committee and the Homeland Security finance subcommittee, which means that financial issues are his legislative specialty. The catch is that this is a heavy-duty REPUBLICAN analysis, with only a limited attempt at non-partisanship or even bipartisanship. Coburn's most partisan offense is what we call "The Big Lie" of Republican budget analysis: citing only entitlements as sources of the nation's debt, while ignoring defense spending. On charts on pp. 16-7, and in analyses elsewhere in the book, Coburn cites only four categories of "Sources of Long-Term Debt": Interest costs, Medicare and Medicaid, Social Security, and Other Spending. Coburn's thesis is that "Other Spending," the biggest category at the time the book was written, will shrink in the future, while entitlements and interest grow. The Big Lie is that in the FY2013 budget, defense spending is MOST of "Other Spending," comprising $797 billion compared to $565 billion of all other discretionary spending. That compares to $820 billion for Medicare/Medicaid and $811 billion for Social Security. If one counts the defense-related departments -- $60 billion for the Department of Veterans Affairs and $55 billion for the Department of Homeland Security (also counted by Coburn in "Other Spending") -- defense spending is larger than either major entitlement program. This Big Lie is a fixture of Republican budget analysis -- pretending that defense spending can't be meaningfully cut. But Democrats are just as guilty -- pretending that entitlements can't be meaningfully cut, for example by calling them "entitlements." Coburn suggests the solution for entitlements is to privatize Social Security (p. 208) and to raise the retirement age for Medicare (p. 199). Those indeed get at the heart of the spending issues for entitlements -- but on defense, Coburn avoids getting at the heart of the issue. All of Coburn's suggestions for defense spending cuts are to trim around the edges, like reducing waste in contracting (p. 260ff), rather than actually reducing, for example, military overseas operations (he voted three times during the period this book was written to keep US troops in Iraq, see VoteMatch question 17, with no offsetting cuts to pay for it). Coburn is sincere, evidently, in his goal of reducing waste in defense spending as well as other spending. He keeps a 400-page list which he called "Coburn's Bible" (p. 152), citing wasteful federal expenditures. His list includes defense spending waste, such as millions spent for each defense branch to maintain a Hollywood liaison office (p. 189), presumably so that each branch will be portrayed well in films. But there is a limit to how much can be saved by reducing waste -- which is why Coburn's recommendations for entitlements go well beyond waste into real programmatic cuts -- Coburn suggests no such real programmatic cuts for defense. Coburn's sincerity in cutting waste, and in cutting the deficit in general, is evidenced by his self-imposed rule that all new legislative spending must be offset by cuts elsewhere. There once was a congressionally-imposed rule, known as PAYGO, but it expired in 2002. Coburn, in his role on Senate finance committees, has re-imposed the rule unilaterally, by requiring all bills that pass through his committees to define offsets for new revenue (pp. 115-22). Coburn details in that section how he took partisan hits for that rule, but we would like to read from his opponents exactly when it was enforced and when it was breached. PAYGO has resurfaced as an issue -- mostly for policy wonks -- but if it passes, this book and Coburn will deserve some credit. With this book, Coburn could position himself as the next Al Gore regarding Reinventing Government -- the Coburn Bible and its 400 pages of wasteful programs would make a fine starting point, which is exactly how Gore started his ReGo campaign, by ridiculing the worst federal programs. 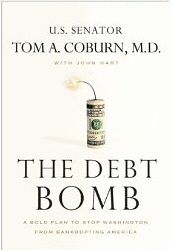 Overall, Coburn's book is a solid piece of work for readers interested in the national debt. Readers should read at least one other book from the liberal perspective, to offset Coburn's partisanship. Tom Coburn: Contraception in health plans breaches religious liberty. Erskine Bowles: Debt is a cancer that destroys country from within. Michael Crapo: Debt crisis threatens our way of life & national security. Milton Friedman: Inflation is a hidden tax, so governments like it. Milton Friedman: Gov't inefficiency comes from spending other people's money. Republican Party: OpEd: If spending is a problem, identify & eliminate waste. Tom Coburn: Great Powers all declined economically before collapse. Tom Coburn: Five stages to trigger the Debt Bomb. Tom Coburn: Moniker "Dr. No" for blocking 10% of all new spending bills. Tom Coburn: The Coburn Bible: 400-page list of $150B wasteful spending. Tom Coburn: Debt crisis threatens our way of life & national security. Tom Coburn: Top US corporations pay effective tax rate of only 3.3%. Tom Coburn: The status quo isn't working, despite $2 trillion. Dianne Feinstein: Ethanol gets triple crown of government intervention. Lamar Alexander: End ethanol subsidy to lower both food prices & federal debt. Pat Toomey: End ethanol subsidy but don't raise taxes. Tom Coburn: Let ethanol tax credit permanently expire. Tom Coburn: Base energy policy on national interest, not environment. Barack Obama: 2005: Worked with Sen. Coburn (R, OK) on Katrina oversight. Tom Coburn: 2005: Worked with Sen. Obama (D, IL) on Katrina oversight. John McCain: Save $30M just by ending duplicative catfish regulation. Mitch McConnell: 2010: Moratorium on earmarks in the 112th congress. Mitch McConnell: Cut virtual incompetence in the federal government. Ronald Reagan: We the people reversed course of government. Tea Party: Constitutionalism means the rules are reliable. Tom Coburn: Expose phone-marking: earmarks by verbal request to agencies. Tom Coburn: All bills should cover new cost by offsetting other spending. Tom Coburn: Clear away duplicative programs instead of creating new ones. Tom Coburn: Earmarks are consistent with socialism, not conservatism. Tom Coburn: Porkbusters: list of spending cuts to reduce government. Joseph Lieberman: Raise retirement age for Medicare from 65 to 67. Tom Coburn: Raise retirement age for Medicare from 65 to 67. Tom Coburn: Some patients will die sooner under ObamaCare's coercion. Tom Coburn: FDA has caused job loss and deadly delays. Dwight Eisenhower: 1961: Be wary of the military-industrial complex. Tom Coburn: Eliminate Hollywood liaison offices for Defense Department. Tom Coburn: Military wastes money by bad contracting and parochialism. Tom Coburn: Focus military research on militarily-related diseases. Tom Coburn: Defense budget lacks common sense & does not lack money. Tom Coburn: 2010 Arizona law should have been allowed. Republican Party: K Street Project: get Republicans into lobbying firms. Tea Party: Be suspicious of politicians wrapped in Tea Party banner. Milton Friedman: Universal program requires backing of society as a whole. Tom Coburn: Give Americans real control over their retirement accounts. John Cornyn: Ending subsidies is not the same as raising taxes. Marco Rubio: We need new taxpayers, not new taxes. Republican Party: Line in the sand: no tax increases (focus on spending). Richard Burr: Ending subsidies does not violate "No new taxes" pledge. Tom Coburn: Tax compliance industry produces nothing of real value. Tom Coburn: End tax earmarks; and don't count that as tax increases. Tom Coburn: Mortgage deduction inflates the cost of housing. Tom Coburn: Real tax reform lowers rates and broadens the base. Dwight Eisenhower: Create interstate highway system because free market won't. Democratic Party: OpEd: If justice is a problem, fix poverty programs. Democratic Party: Line in the sand: protect entitlements (but it needs reform). by John Hart and Sen. Tom Coburn.